Living on an island the internet is my port of call 90% of the time when it comes to shopping and especially when it comes to buying gifts for people! I am seriously limited with the shops in my home town so the more quirky and random websites I can find to order things from the better! 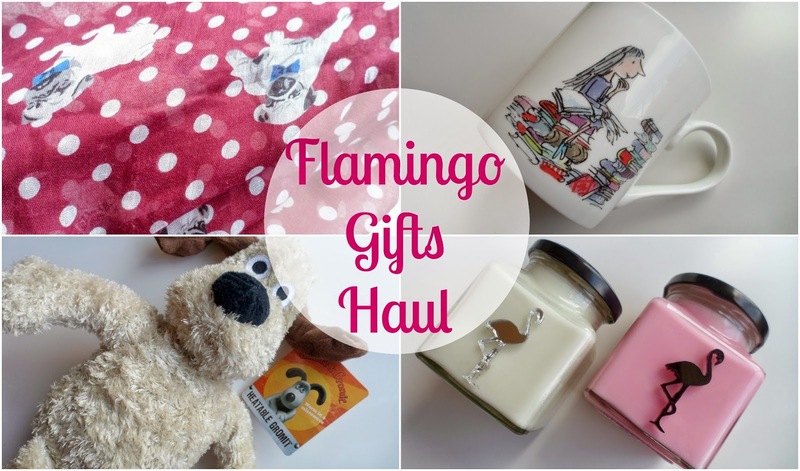 Flamingo Gifts is a new site in my life and it's one of those websites which I went on and just instantly fell in love with everything they sold! This is the sort of store I live for, I love searching through all the different category's and seeing all the different quirky products - I can literally spend hours browsing! The lovely people at Flamingo recently sent me a few products which had caught my eye on the site and I have been overwhelmed by the awesomeness! The cream coloured candle is one of the Aromatherapy candles in the range and is the Relaxing scent. This is a lovely blend of lavender and ylang ylang is something I would have hated when I was younger but as an adult I find it so calming and totally perfect for an evening in reading a book and de-stressing my mind! This one is £11.90. The pink candle is Pink Lemonade (makes sense right?) and my new favourite! If you love sweet scents this is for you, the scent is so strong and fills the room in minutes! A mix of strawberries, lemon juice and champange this sugary fruity scent is perfect for my sweet tooth- plus this one is just £10.20! Not only do these candles smell nice they also look lovely! How cute is this mug!? I love Roald Dahl stories and this mug collection is adorable! Matilda is one of my favourite childhood movies so this one really stuck out to me! Mugs make amazing presents - who doesn't like a nice hot drink, especially at this time of year! As well as quirky household items Flamingo Gifts also has a few fashion items - bags, wallets, scarves etc! I fell in love with this cute pug print scarf as soon as I saw it! There are loads of awesome designs on there, sometimes it's nice to have something to wear that isn't from the highstreet! And lastly we have my new favourite thing! Did someone say a heatable Gromit? Yup that's right! Cuter and a bit more fun than a hot water bottle plus it smells super relaxing too! Just pop it in the microwave and enjoy the warm hug - perfect for all ages! I highly recommend you head over to Flamingo Gifts and have a little look - I can guarantee you'll fall in love and spend your morning, afternoon or evening browsing the endless pages of gifts making a mental wishlist for both yourself and your friends and family! Like this post? Follow A Yellow Brick Blog on  Bloglovin so you never miss a thing! How big are the candles, lovely! My friend is a little obsessed with flamingos at the moment and those candles look perfect for her room, but I don't want to spend that much if they are only tiny! Those candles are so cute! Thats such a great website for gifts, I'm trying to do all my christmas shopping online this year! I love it all but that mug is just too adorable, I think I need to have it. The Matilda mug is great! Flamingo products are lovely. I have only ever tried on of their candles and it was a little disappointing, the scent wasn’t as strong as I thought it would be, didn’t really fill the room, or smell of much to be honest! Definitely want to try out another though. Just taken a look at the wesbite...They have some amazing quirky gifts! Such a lovely collection of gifts, have just taken a look at the website and bookmarked it. I love the Matilda mug, it's been on my wishlist for a while! Never tried Flamingo Candles but the selection of scents is so amazing that I will probably cave in soon enough!